Even though many of us here in Canada cannot access a majority of the hair products that are abundantly available to our friends in the south, there are still a few popular hair products which are available to us at affordable prices. In this post, I have compiled a list of 5 affordable conditioners which can be used for your co-wash or for detangling. A popular conditioner in the natural hair community, Tresemme naturals have great slips which makes them suitable to use for detangling. Their giant sizes allows you to use them generously without having to worry about running out anytime soon. A 750ml size can be bought from Shoppers Drug Mart, Wal-Mart or from any other retailer for an average price of $3.99 if on sale, although the regular price is around $6-$8 depending on where you go. Product description for all three varieties of the Treseme Naturals line says the following. “The Tresemme Naturals Nourishing Moisture shampoo & conditioner system with aloe vera extract and avocado oil, moisturizes your hair to help to protect from damage and breakage. Gentle cleansing and lightweight conditioning for hair that will feel healthy, manageable and smooth. Discover 10X stronger hair after just one use. This salon quality conditioner has no dyes, is hypoallergenic, silicone-free and safe for color treated hair. The TRESemme Naturals Vibrantly Smooth Shampoo & Conditioner system, with coconut oil and jojoba leaf extract, gently cleanses and conditions hair. Hair will be soft, manageable and smooth. Discover 10X stronger hair after just one use. This salon quality conditioner has no dyes, is hypoallergenic, silicone-free and safe for color treated hair. The TRESemme Naturals Radiant Volume Shampoo & Conditioner system, with sweet orange and lemongrass extracts, gently cleanses and conditions hair. This salon quality conditioner helps hair look shiny and healthy. Discover 10X stronger hair after just one use. This salon quality conditioner has no dyes, is hypoallergenic, silicone-free and safe for color treated hair”. 2. Herbal Essence is another popular product line which is a favorite amongst the natural hair community. The most popular product in this line is the Herbal Essence Hello Hydration (HEHH) which can be bought for around $2 for a 300mL bottle although the average price for this size is $4. Product description from the website says “My Moisturizing Hair conditioner is deliciously hydrating. Why not give your dry hair a drink? I say you can never get too much of a good thing. SO say “hello” to a deep dousing of lush hydration with my rich formula. I’ve got moisturizers and a fusion of Hawaiian coconut and orchid. Drink up and replenish much needed moisture, my hair conditioner will reunite you with manageable, silky smooth hair”. 3. Ausie Moist: though I’ve never tried this product, Ausie moist is another highly rated which can be bought on sale for $2, although the average price for the 400 ml bottle is around $3. Product Description on Wal-Mart says “The Moist conditioner is made with splashes of Australian aloe, jojoba oil, and sea kelp which helps seal in natural moisture and takes thirsty tresses from hapless to hydrated”. 4. Suave Naturals: I think the main reason why this product is such a popular co wash conditioner is because of it’s cheap price. Although it only costs about $1 in the U.S, Suave Naturals can be purchased from grocery stores for under $2. 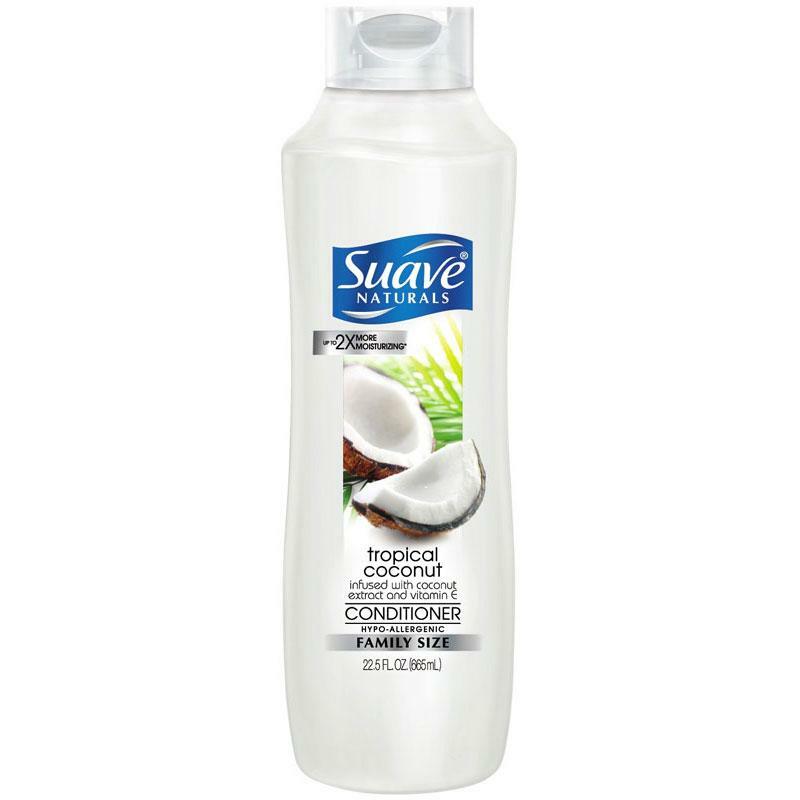 The most popular product in this line is the Suave coconut and I bet it smells absolutely delicious!. Product Description on the website says: Our freshly scented Tropical Coconut Shampoo & Conditioner gently cleanse and condition to bring out the natural beauty of your hair. The hypoallergenic shampoo formula has long-lasting fragrance, while the conditioner formula provides up to 2X more moisture*. 5. 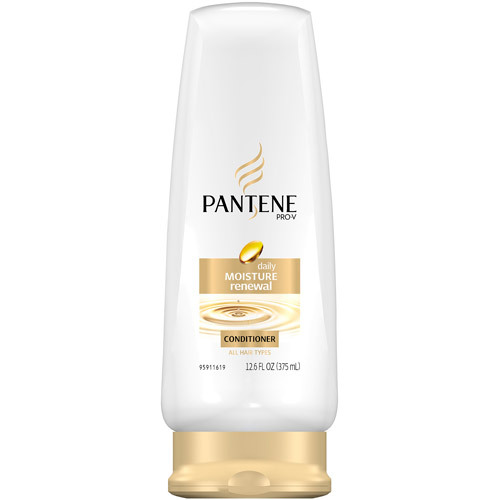 Pantene Pro-V daily Moisture Renewal. Though not as popular but worth trying, this conditioner is affordable enough to be used as a detangler or co-wash. The 375mL can be bought for $4.97 at Wal-Mart. Product description on the website says: “Soak up the Pro-V Science. Lock in moisture with this specially designed formula that mimics the natural moisture layers in your hair”. What other products under $5 CAD would you add to this list? I can testify to the goodness of Hello Hydration! Love it!! <3 It’s pricey in Nigeria though, sigh. Shipping cost to Nigeria makes everything expensive. I use to use HEHH and the slip is so awesome!